Freezing temperatures and inclement weather are a threat to not only humans, but pets as well, so Pet Sitters International (PSI) advises pet owners to take some simple precautions this winter to ensure their pets stay safe. PSI, the world’s leading educational association for professional pet sitters, advises pet owners to only use the services of professional pet sitters for their pet-care needs and to discuss winter weather preparations and policies with their pet sitters. Know your pet sitter’s inclement weather plan. Most professional pet sitters offer pet-sitting services year-round in all types of weather, but make sure your professional pet sitter has your emergency contact on file should treacherous conditions or impassable roads prevent the pet sitter from reaching your home. Keep pets inside as much as possible. Young, old and short-haired pets are more vulnerable to cold weather and should not be left outside unsupervised, and some pets may require warm clothing if they are going to go outside. Pets should not be kept outside in below-freezing temperatures, as both cats and dogs are susceptible to frostbite and hypothermia. 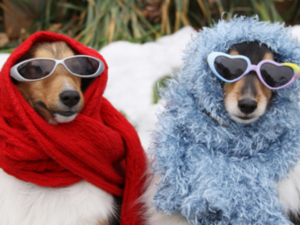 Consult your veterinarian for additional guidance on pet safety in extreme temperatures. Watch out for chemicals. Ice-melting chemicals and salt can irritate and burn the pads of your pet’s paws, so thoroughly wipe off your pet’s paws upon returning inside. Also be sure to thoroughly clean up any antifreeze spills and store household chemicals out of paw’s reach, since antifreeze is poisonous to pets. Discuss emergency care with your pet sitter. Ask any potential pet sitter if he or she has been trained in pet first aid, and provide your pet sitter with signed authorization to take your pet to the veterinarian in the case of an emergency. Make your veterinarian aware of the arrangement and be sure your pet sitter has up-to-date contact information for your preferred veterinarian.